Minneapolis City went undefeated in conference play and set a new conference points record. Aris shut out the highest scoring team in the nation. Defending champions Duluth finished with the same points they had last season, but needed a final match win just to make the playoffs. Med City came roaring back and, in their last, must-win game, they outshot Duluth 16-4 and lost, barely missing the playoffs. The list goes on, and it is a testament to the competitive nature of the conference and the short season that so much happened in so short a time. Part of the reason the conference is so much more competitive is that Duluth FC joined Med City FC in scouring the country for top players, bringing them in, housing them, and getting them into their teams. Several very good Division 1 and NAIA players pitched up in Duluth and Rochester, and it made a very positive difference in the overall level of play in the conference this season. And yet, the conference champion was Minneapolis City, who won the conference using only local players. Yes, the Twin Cities is a bigger market than others in the conference, though the talent is split by the three NPSL clubs there. Additionally, its size is less than the talent pool in the rest of the country, the talent pool from which other conference clubs drew. The success of the locally-focused model is impressive. Not only that, but it is clear that the Crows remain every team’s biggest game, the Manchester United of the North, and that, on and off the field, their opponents are out to get them. That fact adds luster to their win and budding excitement for next season because it is good that teams care as much about the competition as they do in the North Conference. Let’s get to the final installation of the Power Rankings. At the beginning of the season, I questioned whether the Crows had the mentality, the willingness to dig deep, that it would take to win a conference where every single team was out to get them (on and off the field). They could not have answered that question more emphatically. The Crows had clearly learned lessons from last season and put an extreme effort against finding on-field success. A flexible 4-2-3-1/4-3-3 that could as easily dominate possession as it could attack with pace, transformed what had been an obviously talented but brittle team into a cohesive unit. The addition of the U-23 team meant that there was a depth of talent that saw them through an otherwise crushing injury crisis. But it was the team spirit that took a group of local all-stars and made them a team, made them work for each other, made them better than the sum of their parts. Whereas last season, someone would give up the ball and guys would throw their arms up in frustration, this season saw forwards tracking back as hard as defenders and defenders going on lung-busting runs to support their attackers. There were a lot of reasons that Minneapolis City finished top, and the most significant was that they cared about winning because they cared about each other. Before the season started, I identified forward Isaac “Goose” Friendt and midfielder Shae Bottum as players to watch. They combined for a total of 42 minutes played this season, with Friendt injured in the first half of the first game against Med City and Bottum’s new job taking him out of town for training for the duration of the summer. I should have identified midfielder Max Stiegwardt and forward Nick Hutton, with an honorable mention for center back Max Kent, as the players to watch though, given how mean the defense was and how widely the goals were distributed, there was nobody you would not want to watch in this brilliant attacking team. Last season, they won the conference with 28 points. This season, they again accumulated 28 points and were strong challengers for the conference title even though it took a last game victory, and a VSLT swoon, to return to the playoffs. In fact, the victory over Med City on the final day shows a lot about this club. They were completely outplayed, overrun, out-possessed, out-shot, out everything except the scoreline. This is a club that gets more than their fair share of good luck, to the point that you have to start thinking that perhaps they create their own good luck with a mentality, a never-say-die attitude, and the ability to do just enough to get the result. That is a tournament soccer mentality and in the short season of the NPSL it is the type of mentality that keeps this club around the top of the table. They did not win a trophy this season, but it is hard to look at it as anything but successful in the end. Before the season, I highlighted Kyle Farrar and Ryan Tyrer as players to watch on this team. Farrar was, unfortunately, slowed by an injury picked up in the Open Cup and, while he returned late in the season, a mix of lack of games and a new coach with new tactics, tactics that did not appear to use Farrar’s strengths at all, meant that the big target man was not as effective as last year. Tyrer, on the other hand, was immense in defense, all the more critical with Gonnie Ben-Tal’s injury. He even managed to score one or two. One player I did not see coming was Dana Kowachek, who got off to a great start, and is a willing runner with more than a little technique. All that said, the top performer for Duluth this season was midfielder Joe Watt. They certainly made it interesting, coming back from the dead to give themselves the chance to get into the playoffs on the final day. And yet, despite all of that, this season must surely go down as a disappointment for the Medics. Not just because they lost the final game to Duluth despite outplaying them, but because that result was not the first of its kind this season. Over and over, this skilled Medics team would outplay an opponent only to drop points. The late surge made things fun, but tactically the team did not seem set-up for North Conference play with their high line and wide, cross-based attack, that got less than full potential out of their talented forward duo. Before the season, I identified Ignacio Milla and Claudio Repetto as players to watch. That was dead on. Milla helped to steady the ship defensively, while Repetto was as good as advertised, even if he spent most of his time watching crosses sail over his head. Honorable mention goes to Francisco Neto, who dovetails so well with Repetto in the attack and has a sneaky acceleration that gets him into dangerous areas before the defense can even tell. Before the season, I picked the Sky Blues as conference dark horses. They had finished fifth the season before, well off the pace of the playoffs teams, and yet it seemed like a nip here, a tuck there, and a balancing out of the bad luck that befell them and they could compete. Compete they did. Channeling their inner Spain, they used possession as a defensive weapon and became masters of the 1-0 on their way to topping the conference just before the halfway point. 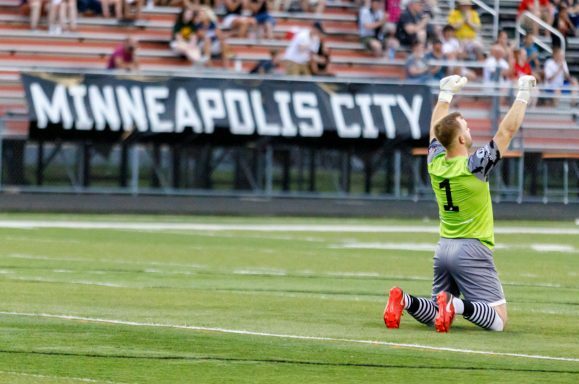 While they surrendered that lead to Minneapolis City, and then lost control of their title destiny to Minneapolis City, with three games left they had control of their playoff destiny. Then the wheels fell off. A loss away to Sioux Falls with just 13 players traveling, reportedly because many elected to play, for pay, in the Hmong Independence Tournament, gave up control of their own fate and, with Duluth beating Med City on Friday, VSLT’s loss to TwinStars was already academic, but still disappointing, for a team that had overachieved early and skidded down to fourth late. Before the season started, I identified Ayuk Tambe and Zuheer al-Abase as players to watch. I wish I had known then that Tambe was not going to play because I would have instead picked Boris Zaraguro, a former professional in the Ecuadorean first division, whose energy, technique and dead ball prowess were just what VSLT needed in the engine room. Al-Abase did well too, providing a creative spark in the team. I should have called out winger Mark Boquin and former Duluth forward Andrew Jenkins because they were, in the end, more important to the VSLT attack. While they finished just about where I had them in my pre-season write-up, the Kicking Dragons are a massive disappointment yet again. Off the field, their “technical difficulties” game cancellation that went unpunished by the league will live long in everyone’s memory as a slimy act of gamesmanship. On the field, their outrageously dirty play and eye-poppingly bad disciplinary record is just another black mark that this club brings to the league. It is made all the worse because they have very good players and, with some discipline and organization, could easily have made a run at the points title instead of the bookings title. With Chase Wright scoring goals for fun, a midfield with Christian Deaconson and Ethan Pitre, Grant Dumler flying up and down the touchline, Tyler Oliver and Karim Darbaki as proven attackers, and excellent goalkeeper Sean Teske, this group should have done better than fifth. At this point though, after so many years of this exact behavior and this exact outcome, it seems silly to hope for more. This is what the club is. This is what the club does. Before the season, I identified Karim Darbaki and Sean Teske as the key players and both contributed well, though Teske was left splitting time with Ibrahim Toure for most of the season. However, Chase Wright’s purple patch this summer, which propelled him to the top of the conference scoring charts, cannot be ignored, and a more clairvoyant writer than I would have singled him out as well. An improvement on last season, though the Thunder again finished in seventh place, this likable club remains well off the pace of the rest of the conference. On the positive side, bringing in Mekonnen Afa as coach brought a new level of organization to the team and Afa deserves credit for making the very most of the talent available to him. The negative is that there might not be enough talent in Sioux Falls, South Dakota to compete at the NPSL level and, given the relative paucity of means that the Thunder have as a club, no realistic way for them to recruit and house the talent that would make a difference. The Thunder remain a lovable band of guys who are doing the hard work to build a club. The hope is that they can do that, while attracting fans and sponsors that will continue to help them grow, without winning very many games. While I had picked them as the team most likely to take a step back this year, to the point that they were fifth in my pre-season rankings, I thought it was going to be much, much closer than this. Playing away, they have been absolutely terrible with the 11-0 loss to Med City FC eclipsing other embarrassments like the 5-2 loss at Sioux Falls Thunder and the 5-0 losses at Minneapolis City and Minnesota TwinStars. They have done better at home, outside of the 8-0 loss to Minneapolis City this weekend, but it is impossible to have done worse. I have been silently questioning this organization, which has seen its men’s and women’s teams get blown out on the field repeatedly. The silver lining, such as it is, being frequent terrible attendances, which have been less than 100 for multiple games this season, meaning that nobody has actually seen these results. While the club’s owner is a wealthy entrepreneur who also runs the biggest local soccer club and that insulates the Fusion from having to be run as a business, how long does it make sense, even as a hobby, to have noncompetitive NPSL and WPSL teams that nobody watches? Things need to change in the Red River Valley and they need to change quickly. They were able to get a famous draw against conference champions Minneapolis City and, while it took keeping everyone behind the ball every minute of the game, growing the grass long, and all the luck in the world, it is a credit to them for doing what it takes to get a result. Then, proving it was no fluke, they almost did it to Med City the next weekend. Though the final two games stood out, the truth is that at home this Aris side was very hard to break down all season long. Success in this game starts with being hard to beat and, if this is the first step toward a more competitive Aris, then that is a good thing.